It is finished!! It turned out better than I imagined!! I usually do very colorful boards...so this felt risky. 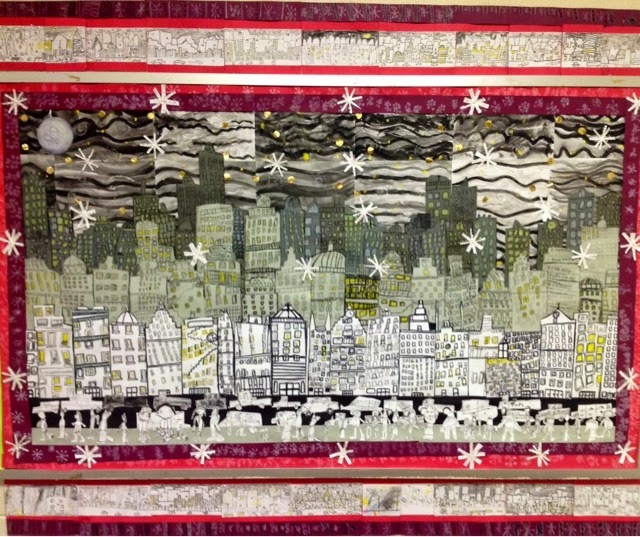 One teacher said they thought it looked like pollution/smog when I first started putting it up. That didn't help my insecurity!?! Haha!! The kids love it...and are super proud of the part they played in it!! OHHHHH! I love this. Striking! Don't let a nonbeliever take you down. Great bulletin board. Not smoggy at all! It looks like a Faith Ringgold quilt done in neutrals. Love it! Can you explain what the components are that are under and over the bulletin board? It looks like very interesting framing, but from the photo it's hard to say exactly what they are.c is it more student artwor? Who and what? Process details please? Absolutely Beautiful! I love dramatic effect of the black and white and gray scale! It reminds me a little of Ezra Jack Keats.